Duration at 050 inch Lift:222 int./230 exh. Intake Valve Lift with Factory Rocker Arm Ratio:0.615 in. Exhaust Valve Lift with Factory Rocker Arm Ratio:0.609 in. Valve Lift with Factory Rocker Arm Ratio:0.615 int./0.609 exh. 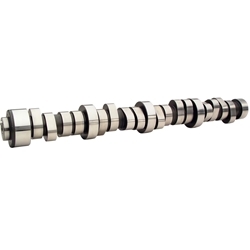 Camshaft Manufacturers Description:Best all around performance grind for 6.4L applications. COMP Cams Chrysler Hemi phaser camshafts utilize Variable Valve Timing (VVT) technology to maximize power and performance in stock and street/strip applications. The new Hemi engines from Chrysler are great power plants straight from the factory, with technology that allows the camshafts to move in real time. Instead of scrapping this advanced system, COMP Cams has embraced it with a new line of aftermarket Hemi-specific cams. The patent-pending Hemi phaser camshafts work with phaser limiters or locks to fully utilize Chrysler's Variable Valve Timing (VVT) technology, which allows them to pick up torque in the low end of the engine, while maintaining power up high. Made from a billet core, these hydraulic roller cams are engineered tough enough to handle 5.7L and 6.4L Hemi street/strip engines. Their unique, no-springs-required design maintains piston-to-valve clearance, while enabling high performance lobes utilizing VVT, making them perfect for late model Dodge Challengers, Dodge Chargers, Chrysler 300s, Jeeps, Dodge trucks, and Mopar crate engines with VVT. COMP Cams Chrysler Hemi phaser camshafts are available as both custom and three different off-the-shelf grinds, dependent upon engine type, for improved performance over OEM options. They will require the COMP Cams phaser limiter or lock kits to limit the degree of maximum cam phasing to 14 crank degrees (7 cam degrees) and they are available separately.